Between a New Orleans pit stop to enjoy some good music and the start of a major Spivey Paint Project, I decided to embark on a new cold dip recipe this past weekend that my friend and coworker passed along to me. I had a little bit of time to spare early Saturday morning and threw it together before we started our day of painting. Since the dip tastes better the longer it marinates, I knew we would be able to give it a good taste test in time for the afternoon LSU football game. This is definitely the perfect football party dip. Not only does it make an enormous amount, it has all the proper ingredients for a dip addiction. I’m not exaggerating. It’s the type of dish that you try one bite and before you know it, you’ve eaten the entire bowl along with an entire bag of Fritos. Therefore, when you go to the store, make sure to buy the family size bag of Fritos. As I mentioned before, I don’t do complicated and the most labored part of this recipe is chopping a handful of ingredients. Easy enough for me! I did add some fresh jalapenos that my neighbor recently shared with us from his garden but you can leave those out if you want. Enjoy Everyone! Mix all of the ingredients together and season to taste. I used Slap Your Mama’s but Tony’s would work too. Be careful not to use too much seasoning because it does intensify after marinating in the refrigerator. Note: I added the jalapenos to the recipe because I wanted an extra kick. Thank you Leslie! 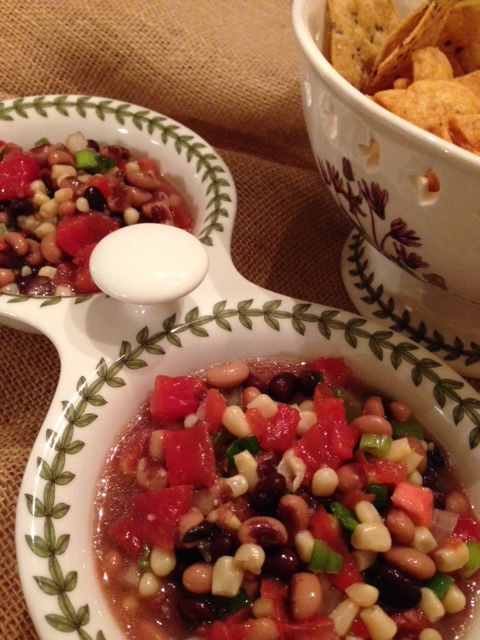 It is delicious as a dip or just a bean salad.